It’s a fact of life that while we live in Paradise (Scottsdale), we occasionally have to leave it and go to…Phoenix. I had to make one of those trips this morning and was searching through the cobwebs to remember some place to meet an associate in the vicinity of 44th Street and Camelback. Turns out, Google was my friend in this search. It led me to Carmel’s Coffee just west of that intersection, on the south side of Camelback. 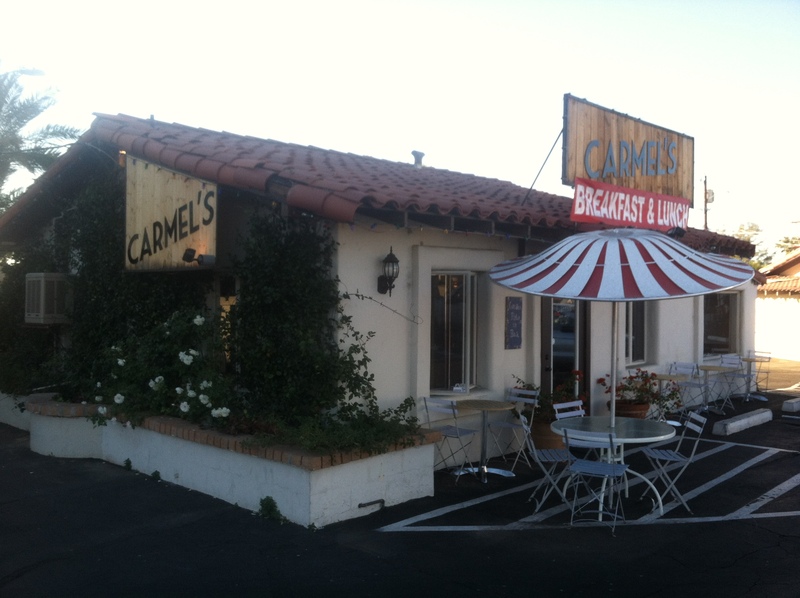 Carmel’s is in a small shopping center immediately west of the larger office building on the corner. It looks like a small ranch house, and inside is everything you’d ever want in a local coffee house. Plus, the grill was emitting some savory aromas when we walked in. We both had breakfast of a lighter European fare–much better than a pastry, but not as filling and heavy as a typical eggs-and-bacon plate. I got the “Tartine” open-face toast with poached eggs, asparagus, goat cheese, and roasted cherry tomatoes. Wow. Online menus are being updated to reflect an ever-expanding selection. Nice article regarding Carmel’s coffee… except the snooty part at the beginning referring to having to leave Paradise (Scottsdale? ), and come to Phoenix. Thanks, Shannon. I guess I was kind of poking fun at myself and those like me who don’t get out very much. Didn’t mean for it to sound that condescending. I’ll do better next time, but you may have to remind me occasionally. Next coffee is on me! Having a business is tough especially when you have to travel. I personally didn’t think what John said was at all snotty . Some people are comfortable in their own neighborhoods. I can see how it may have come off but dang woman. Relax a little when it comes to jumping down peoples thoughts and find a more appropriate thing to get all bitchy about. Like hmm I dunno Equal Rights. Labor Laws In Maricopa. Food for thought.